In 1957 J J Warmington, father of local historian and editor of “Campden: a New History”, Allan Warmington, wrote an article he called “Some Notes on Campden of Days Gone By”. This is the first of a number of extracts from that article. residents who remembered these things are now dead and unless those to whom they told these things write them down, the details will be lost for ever. There were three principal sets of gates at Campden. The first, of which I have no details, was at Pauls Pike – with gates controlling roads to Evesham and Stratford-on-Avon. Probably much alteration has been made to this junction since the tolls were abolished, for it is quite possible that the small stonebuilt back part of the present brick cottage was the toll house, and the road junction was close to it, so that one gate controlled both roads for traffic to and from Campden. It is possible that the Evesham road then ran behind the present row of cottages. The stone cottages that used to stand at the ends of the gardens behind these cottages possibly then faced the road. The old Jews harp player, old Joby Bates, lived in one of these stone cottages. At Scuttlebrook Wakes he used to be persuaded to stand on the seat round the chestnut tree and play his Jews harp for quite long periods. The next toll gate was across the station road, just a few yards below the gateway to Berrington Mill. Until quite recently a short piece of hedge grew out towards the roadway; it once reached to the gatepost of the tollgate. The gate keeper’s cottage stood on what is now the footpath to the station. This cottage was occupied by the parents of the late George Badham. His father was John Badham and his mother collected the tolls. John Badham also had a donkey and cart and used to do small hauling work. He undertook the excavation of the cutting known as Campden Hole, making a connection from Farmcombe Drive towards Campden – a very steep, and in winter, a very “draughty” spot. George Badham, his brother John and his sisters were all born at this tollhouse. A few years ago, not long before his death, G.B. drew and painted a small picture from memory of this cottage and the gate. When the tollgate was abolished the gate was transferred to the entrance to the “Big Ground”, a little nearer the town, where it remained until early this century. An incident he related concerned a Campden sweep who, returning from Ebrington during a night, tried to evade toll payment by taking his donkey from the cart and lifting and pushing it over the gate; but getting caught and made to pay because he made so much noise when trying to get the little cart over! 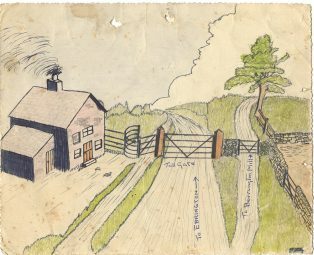 The third system of gates was based on Westington Corner, and comprised control of both branches of the junction at that spot, with subsidiary gate at the entrance to Blind Lane and the lane from near the quarry to Broad Campden. For these two subsidiary gates the roll keeper needed a family of growing boys who could spend their time at the gates, or to pay other to do so. Westington Corner in those days was sufficiently bottlenecked for ten foot gates to close the roadway. The cottage stood partly on the roadway in front of the present Pike House, which in those days was known as “Tilt-up End Cottage”. Part of the garden wall, now beneath the box hedge was said to be part of the turnpike cottage. 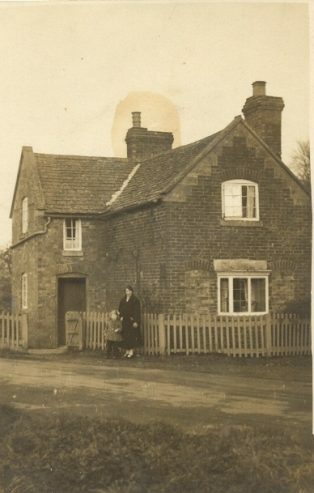 The parents of the late John Keen, bootmaker, kept this tollgate, and he used to tell of his boyhood, and of spending many lonely days up on the hill. Turning back to the Westington Toll Keeper, I have learnt since I wrote the last paragraph that the Keen family were not the actual toll keepers, but in a way were sub-contractors. They lived in a now-vanished cottage that stood in the Pike Cottage vegetable garden of today – quite close to the modern house erected by Mr. W. T. Hart. The site was later occupied by a Church of England chapel which stood for a short time, afterwards replaced by Broad Campden church. There must also have been some form of tollgate control on the crossroads near Dover’s Hill, but I have heard nothing of these, if there were any. These details bring back the days of the turnpike road to those who knew John Keen and his brother – once the estate carpenter – and the Badham family.